When my husband and I lived in San Diego, we ate Vietnamese food pretty much every week. There was a popular Pho restaurant we would frequent for their delicious (and cheap!) Pho noodle soups, vermicelli noodles and Summer rolls. When I ordered vermicelli noodles I always had it with grilled pork or pork meatballs. 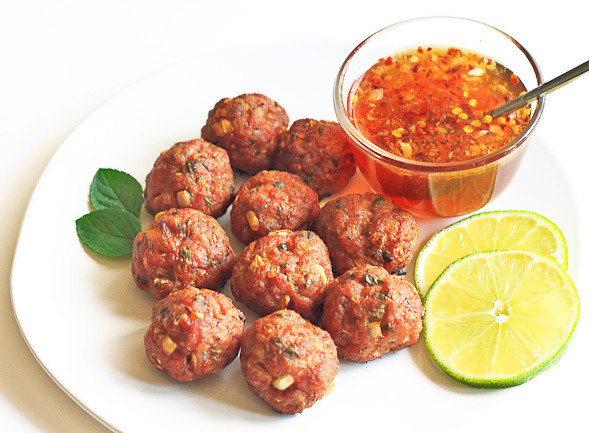 The meatballs were so flavorful and juicy, made with fish sauce, sugar and mint, a popular Vietnamese combination. 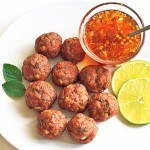 Here is my version of Vietnamese meatballs paired with a sweet and tangy dipping sauce. If you don’t have fish sauce, you can use soy sauce instead. When the meatballs are done cooking, I like to add an extra squeeze of lime juice on top. 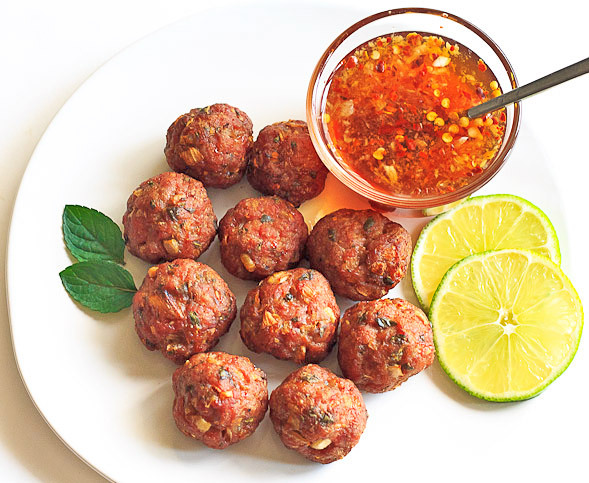 Serve these meatballs with dipping sauce, steamed rice and fresh vegetables. Stir together mint, fish and soy sauce mixture, shallot and garlic, then mix in ground pork. Roll into balls and bake for about 20 minutes until golden brown and cooked through. Serve with a squeeze of lime and Vietnamese dipping sauce. Preheat oven to 400° F. Lightly grease a sheet pan with oil and set aside. 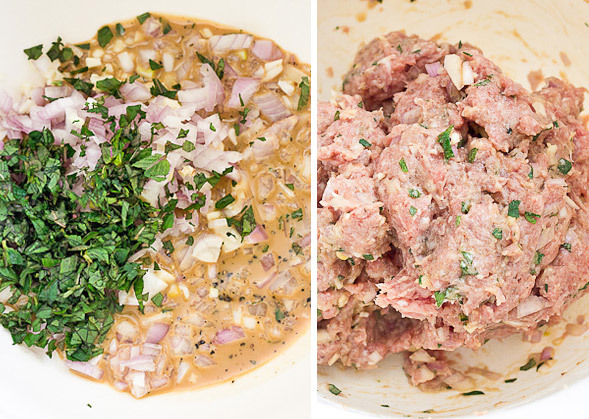 In a bowl, mix all ingredients together thoroughly with your hands. 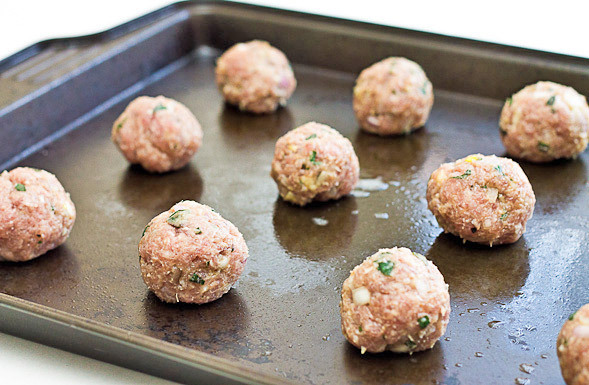 Roll into about 30-40 meatballs and place on pan. Bake until golden brown, about 20-25 minutes or until cooked through and not pink in the middle. While cooking, prepare the dipping sauce. In a mortar and pestle, crush garlic and red pepper into a paste. Place paste in a small serving bowl and stir together with agave nectar, fish sauce, lime juice and water. Serve meatballs with the Vietnamese dipping sauce, steamed rice and vegetables. Love this! I must try this recipe. It will be gone in a few seconds if I make this for my family. Thanks for sharing, Barb! Yum! I have a ton of ground turkey (hello, husband going crazy at Costco) so I’m going to try it with that for tomorrow night’s dinner. Betty Ann – We had them last night for dinner and it didn’t take long to finish! 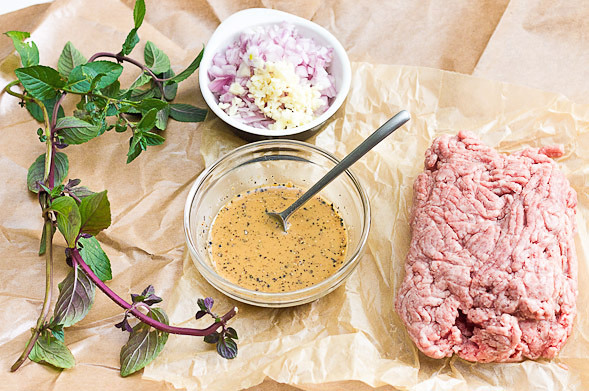 Heidi – Let me know how it turns out with the ground turkey. I’d like to try that sometime. These look great! Seems like they’d be delicious with holy basil mixed in too! Ooh you’re right, love holy basil…I’ll try that next time! I just made a version of this based on a recipe I saw in Family Fun Magazine. They are very yummy! Thank you for sharing your recipe for the dipping sauce. Hi Donna, they sound delicious grilled, yum!